Ravindra Pogaku's teaching strategy is to extract the hidden talents of budding students. In this workshop, he will share 35 years of thoughts on teaching and research and the exciting experiences he has had with students. The emphasis will be on how the bubbling enthusiasm of the students motivated him towards productive teaching and research in higher learning institutions. This will be an interactive session with the participants leaving the workshop with an outline of effective teaching and research techniques for a sustainable society. Ravindra Pogaku is a Research Professor of chemical and bio process engineering at the University of South Carolina. He was a visiting professor at Pennsylvania State University and Cornell University. Pogaku has rich, versatile and varied experience in teaching, research, industry, executive and administrative fields spanning over 35 years. 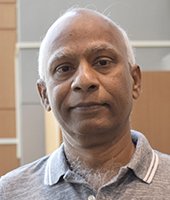 His research work has culminated in over 225 research publications, critical reviews and presentations including six books, seven book chapters and edited three books. He is the editor-in-chief, editorial board member, guest editor in referred journals and reviewer of many peer journals. He has carried out as many as 25 national, international and industrial research projects. Pogaku was the recipient of the distinguished chemical engineering award from Indian Institute of Chemical engineers. He has won gold and silver medals for his research contributions in the chemical and bio processing fields. He also served as an UNESCO energy consultant. He has designed and developed Pilot plants for bio-fuels. He has delivered invited lectures, plenary talks and keynote addresses at various National and International institutions, conferences etc. He loves to interact and disseminate information on the "Joys of teaching and research" in various seminars across the world.